The music of the Portuguese Renaissance has until very recently languished in almost complete obscurity. Certain composers who were fortunate enough to see their works published during their lifetimes—such as Manuel Cardoso, Duarte Lôbo, and Filipe de Magalhães—have begun to receive the recognition they deserve, but the same does not yet apply to the vast body of music which is preserved only in manuscript. Much the largest collection of such manuscripts, dating from the sixteenth century onwards, originated at the Augustinian monastery of Santa Cruz in Coimbra (in northern Portugal). This monastery, the mother-house of the Augustinian congregation in Portugal, was an educational and cultural centre of the first rank, with a flourishing musical life. The most important composer to have worked there, Pedro de Cristo, was born in Coimbra in about 1550, and took his vows at Santa Cruz in 1571. He eventually succeeded to the post of mestre de capela (that is, director of the polyphonic choir) in the 1590s. Dom Pedro also spent at least two periods in Lisbon, as mestre de capela at the Monastery of São Vicente. An obituary marking his death in 1618 mentions his skill as an instrumentalist as well as a composer, and notes that his musical talents caused him to be sought after at many houses of the Augustinian congregation. The sacred works of Pedro de Cristo—which number over two hundred—dominate the manuscripts from Santa Cruz dating from the 1580s to the 1620s; indeed, several of these manuscripts are in the composer’s own hand. Many of the texts which he set reflect devotional emphases particular to Santa Cruz. A clear example is the motet Sanctissimi quinque martires, celebrating the ‘five martyrs of Morocco’, Franciscans who died in 1220 while preaching to the western Moslems, and whose relics were kept at Santa Cruz. While this piece displays for the most part a conventional contrapuntal technique, Dom Pedro often employed a more vertically conceived and rhythmically animated style, seen particularly clearly in his settings of responsories for Matins on Christmas Day and in works scored for two choirs (such as the Magnificat on the eighth tone and Ave Maria performed here). In the Christmas responsories each sense-unit of the text is set separately, with meticulous attention to proper accentuation, producing a vivid form of musical rhetoric. Among the other Portuguese composers whose works are preserved in the manuscripts from Santa Cruz, one of the finest is Airez Fernandez. Unfortunately, nothing is yet known for certain about his life (although it is likely that he worked in Coimbra, possibly at the cathedral), and relatively few pieces ascribed to him survive complete. The setting of the Marian antiphon Alma redemptoris mater demonstrates his skill at producing marvellously shaped phrases within a very simple texture. The achievement here is the more impressive for the fact that the tenor part follows closely the plainchant melody for this antiphon. Frei Manuel Cardoso was born in Fronteira, part of the archdiocese of Évora, in 1566 (though formerly his birth date was thought to be 1570) and professed as a monk in Lisbon on 5 July 1589. He was, according to Father Manuel de Sá, ‘sent to Évora, there to study Grammar and the art of Music’ as soon as he was old enough, which he was considered to be in 1575 at the age of nine. Cardoso was taught there by Father Cosme Delgado and Father Manuel Mendes. Later in his career, Cardoso was to enjoy the favour of the Spanish royal house. He dedicated his 1631 book of Masses on the Ab initio theme to Philip IV. He was also connected with the Bragança family while he was at the Carmelite Priory in Lisbon, and it is probable that the future King João IV was his pupil as well as his patron. Cardoso enjoyed great esteem during his lifetime for his pious life as much as for his exceptional musical gifts. He was frequently mentioned by his renowned contemporaries, literary and musical, and when he died in 1650 he was held in universal affection and respect. There survive five published collections containing Cardoso’s œuvre: three books of Masses and two volumes containing Magnificats and motets. Two of the motets recorded here—Sitivit anima mea and Non mortui—were in fact included in one of the Mass collections: that of 1625 which contains the Missa pro Defunctis. They both have texts associated with the funeral rites. The other works come from the 1648 book which was Cardoso’s last publication. Characteristic of all these pieces is the combination of contrapuntal writing in the manner of Palestrina (the parody Masses in Cardoso’s 1625 book are all in fact based on Palestrina) with a very personal grasp of harmony. The augmented intervals, unexpected entries and progressions, and false relations which abound are, while not unique to Cardoso, certainly even more evident in his work than that of his contemporaries in Portugal such as Duarte Lôbo. Cardoso did also write polychoral music—a more obvious outlet for such features of ‘Baroque’ style—but it was all lost in the earthquake of Lisbon in 1755. It is the admixture of these characteristics with his excellent knowledge of classic Palestrinian counterpoint that gives Cardoso’s music its individuality. Nos autem gloriari illustrates well the typical procedure in these motets, which begin with conscientiously worked imitation (often of three points, the second being an inversion of the first) and then continue in a less rigorous fashion, though always with the greatest respect for word setting. In Mulier quae erat the chromatic inflections of the imitative working of the opening are such that no specific tonality is apparent until all the entries have appeared and, as it were, confirmed their tonality with each other. These chromatic twists, perhaps curiously, do not contradict the serenity transmitted by much of Cardoso’s music (whether motets or Masses); and this, one may feel, is truly a characteristic of the Baroque. Apart from the Missa pro Defunctis, the most resplendent example of this ‘chromatic serenity’ is probably to be found in the Lamentations. Those for Maundy Thursday are replete with all those features found in the motets, and yet Cardoso is never guilty of untoward exaggeration. Liturgical propriety is alway respected. João Lourenço Rebelo was born in Caminha, in the province of Minho in northern Portugal in 1610, forty-four years after Cardoso, though he outlived him by only eleven. His brother Marcos Soares Pereira (the reasons for Rebelo’s changing of his name are unknown) was chaplain-cantor at the Ducal Chapel in Vila Viçosa, and when he took up the appointment he took Rebelo with him, there to receive instruction in music. Ducal (and later royal) patronage was a fundamental element in Rebelo’s life, and it would appear that Dom João IV wrote two six-part motets (of which only one voice part now survives) to complete one of Rebelo’s publications. Most of Rebelo’s music was published in 1657, a year after the death of the royal patron who had in his will ordained the printing of the edition. It contains fourteen Psalm settings (two sets of seven; each text set twice), four Magnificats, Compline music, two Lamentations, and a Miserere. 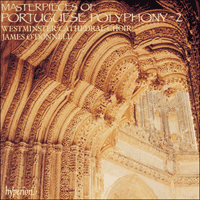 The modern polychoral style of most of these works makes Rebelo a figure of considerable significance in the history of Portuguese music. There is also a small group of unpublished works for smaller ensembles, among which may be found Panis angelicus. While it cannot be described as polychoral, Panis angelicus is in other respects a good illustration of Rebelo’s music, using as it does a distinctive, sometimes fragmented, melodic style and stretches of homophonic or near-homophonic writing. Here we see perhaps the furthest limits that the combination of genuinely sustained contrapuntal writing with elements of the newer styles could attain. In this it may well stand as an emblem for Portugal at this period, standing at the farthest edge of Europe and receiving the winds of change from elsewhere in Europe in her own time. Jusqu’à une période récente, la musique de la Renaissance portugaise a langui dans une obscurité presque complète. Certains compositeurs, qui eurent la chance de voir leurs œuvres publiées durant leur vie—comme Manuel Cardoso, Duarte Lôbo et Filipe de Magalhães—commencent à recevoir l’attention qu’ils méritent, mais il n’en est pas de même pour la vaste masse de musique qui n’est préservée qu’en manuscrits. Une grande partie de la collection la plus importante de tels manuscrits, qui remontent au seizième siècle, a été créée au monastère de Santa Cruz, de l’ordre de Saint Augustin, à Coïmbre (dans le Portugal du Nord). Ce monastère était la maison-mère de la congrégation augustinienne au Portugal, et un centre d’éducation et de culture de premier ordre, avec une riche vie musicale. Le compositeur le plus important qui y ait travaillé, Pedro de Cristo, naquit à Coïmbre vers 1550, et prononça ses vœux à Santa Cruz en 1571. Il succéda au poste de mestre de capela (c’est-à-dire de directeur du chœur polyphonique) dans les années 1590. Dom Pedro fit aussi au moins deux séjours à Lisbonne, comme mestre de capela au monastère de São Vicente. Un article nécrologique à l’occasion de sa mort en 1618, fait mention de son talent d’instrumentiste aussi bien que de son talent de compositeur, et remarque que de nombreuses maisons de la congrégation augustinienne appréciaient ses talents musicaux. Les œuvres religieuses de Pedro de Cristo—plus de deux cents existent—dominent dans les manuscrits de Santa Cruz de la période entre les années 1580 et 1620; et plusieurs sont effectivement écrites de la main même du compositeur. Parmi les textes qu’il a mis en musique, nombreux sont ceux qui reflètent l’emphase pieuse qui était particulière à Santa Cruz. Le motet Sanctissimi quinque martires en est un exemple évident; il célèbre les «cinq martyrs du Maroc», moines franciscains qui moururent en 1220 pendant qu’ils prêchaient aux musulmans occidentaux et dont les reliques étaient gardées à Santa Cruz. Ce morceau est écrit dans sa plus grande partie selon une technique contrapuntique conventionnelle; mais Dom Pedro utilise souvent un style conçu plus verticalement avec une animation plus rythmique, qui est particulièrement évident dans ses arrangements des répons pour les Matines de la Noël et dans des morceaux orchestrés pour deux chœurs (comme le Magnificat dans le huitième mode et l’Ave Maria qui sont interprétés sur ce disque). Dans les répons de la Noël, chaque sens différent du texte est mis en musique séparément, et la correcte accentuation est méticuleusement respecte; il en résulte une forme brillante de rhétorique musicale. Aires Fernandez est l’un des meilleurs parmi les autres compositeurs portugais dont les œuvres sont conservées dans les manuscrits de Santa Cruz. Nous ne savons malheureusement rien de certain sur sa vie (bien qu’il ait probablement travaillé à Coïmbre, peut-être à la Cathédrale) et relativement peu d’œuvres qui lui sont attribuées ont survécu complètes. La mise en musique de l’antienne de Marie Alma redemptoris mater est un exemple de son talent à produire des phrases merveilleusement formées à l’intérieur d’une texture très simple. Le fait que la partie du ténor suit de très près la mélodie du plain-chant dans cette antienne rend sa réussite encore plus remarquable. Frei Manuel Cardoso naquit à Fronteira, qui faisait partie du diocèse d’Évora, en 1566 (bien que 1570 ait longtemps été donné comme sa date de naissance) et prononça ses vœux à Lisbonne le 5 juillet 1589. Cardoso était tenu en grande estime durant sa vie autant pour sa piété que pour ses dons musicaux exceptionnels. Ses contemporains célèbres, littéraires ou musicaux, font souvent mention de son nom et à sa mort en 1650 il était universellement aimé et respecté. Il survit cinq collections publiées de l’œuvre de Cardoso: trois livres de Messes et deux volumes contenant des Magnificats et des motets. Deux de ces motets qui sont enregistrés ici—Sitivit anima mea et Non mortui—faisaient partie, en fait, d’une des collections de Messes, celle de 1625, dans laquelle se trouve la Missa pro Defunctis. Tous deux ont des textes associés aux rites funèbres. Les autres œuvres viennent du livre de 1648 qui fut la dernière publication de Cardoso. Ce qui caractérise tous ces morceaux est la combinaison de l’écriture contrapuntique à la manière de Palestrina avec une compréhension toute personnelle de l’harmonie. Les intervalles augmentés, les entrées et les progressions inattendues et les fausses relations qui y abondent, bien qu’elles n’apparaissent pas uniquement chez Cardoso, sont certainement encore plus évidentes dans ses œuvres que dans celles de ses contemporains au Portugal comme Duarte Lôbo. Cardoso écrivit aussi de la musique polychorale—qui convient manifestement mieux à de tels traits de style «baroque»—mais toutes ces œuvres ont été perdues dans le tremblement de terre de Lisbonne en 1755. C’est l’incorporation de ces caractéristiques à son excellente connaissance du contrepoint classique de Palestrina qui donne à la musique de Cardoso son individualité. Nos autem gloriari est une excellente illustration du procédé de composition typique dans ces motets: cela commence avec une imitation consciencieusement travaillée (souvent de trois points, le second étant l’inversion du premier) et continue ensuite d’une façon moins rigoureuse, bien que toujours avec le plus grand respect pour la mise en musique des paroles. Dans Mulier quae erat les inflections chromatiques du travail d’imitation du debut sont telles qu’aucune tonalité spécifique n’apparaît avant que toutes les entrées aient été faites et aient, pour ainsi dire, confirmé leur tonalité les unes aux autres. Ces nouveautés chromatiques ne contredisent pas, curieusement, la sérénité qu’exprime la plus grande partie de la musique de Cardoso (que ce soit des motets ou des messes); et l’on peut penser que c’est une vraie caractéristique du baroque. L’exemple le plus resplendissant de «sérénité chromatique», à part la Missa pro Defunctis se trouve probablement dans les Lamentations. Celles du jeudi Saint sont pleines de ces éléments caractéristiques déjà rencontrés dans les motets, et pourtant Cardoso ne se rend jamais coupable d’une exagération malencontreuse. Il respecte toujours la correction liturgique. João Lourenço Rebelo naquit quarante-quatre ans après Cardoso, bien qu’il ne lui survécut que de onze ans. Il était né à Caminha, dans la province de Minho dans le Portugal du nord, en 1610. Son frère Marcos Soares Pereira (nous ne connaissons pas les raisons qui poussèrent Rebelo à changer de nom) était chapelain-chantre à la Chapelle ducale à Vila Viçosa, et avait emmené Rebelo avec lui lors de sa nomination à ce poste, afin qu’il y apprenne la musique. Le patronage ducal puis royal fut un élément fondamental de la vie de Rebelo, et il semble que Dom João IV écrivit deux motets à six parties (dont seulement une partie vocale survit de nos jours) pour compléter une des publications de Rebelo. La majeure partie de la musique de Rebelo fut publiée en 1657, un an après la mort du protecteur royal qui en avait ordonné la publication dans son testament. Elle contient quatorze mises en musique de Psaumes (deux groupes de sept; chaque texte est mis en musique deux fois), quatre Magnificats, de la musique pour Complies, deux Lamentations et un Miserere. Le style polychoral moderne de ces œuvres donne à Rebelo une importance considérable dans l’histoire de la musique portugaise. Il y a aussi un petit groupe d’œuvres non publiées pour plus petits ensembles, parmi lesquels on peut trouver Panis angelicus. Bien qu’il ne puisse être décrit comme polychoral, Panis angelicus est sous d’autres aspects une excellente illustration de la musique de Rebelo, car il y utilise un style mélodique distinctif, quelquefois fragmenté, et des passages d’écriture homophonique ou presque homophonique. C’est là peut-être que nous voyons les limites extrêmes que peut atteindre la combinaison d’une écriture contrapuntique authentiquement maintenue avec des éléments de styles plus nouveaux. C’est la raison pour laquelle ce morceau peut être considéré comme le symbole du Portugal de cette époque, ce pays qui, par sa position à l’extrémité la plus éloignée de l’Europe, reçoit à son heure les nouveautés du reste de l’Europe. Die Musik der portugiesischen Renaissance hat bis vor kurzem ein kaum beachtetes Schattendasein geführt. Gewissen Komponisten, die das Glück hatten, ihre Kompositionen zu Lebzeiten veröffentlicht zu sehen—so zum Beispiel Manuel Cardoso, Duarte Lôbo und Filipe de Magalhães—wird allmählich die Anerkennung zuteil, die ihnen gebührt, aber das gilt noch nicht für die übergroße Zahl von Musikwerken, die nur handschriftlich erhalten sind. Die wohl größte Sammlung solcher Handschriften, die im 16. Jahrhundert begonnen wurde, stammt aus dem Augustinerkloster Santa Cruz in Coimbra (im Norden Portugals). Dieses Kloster, Stammhaus des Augustinerordens in Portugal, war ein Bildungs- und Kulturzentrum hohen Ranges mit einem blühenden Musikleben. Pedro de Cristo, der bedeutendste Komponist, der dort gearbeitet hat, wurde um 1550 in Coimbra geboren und 1571 in Santa Cruz zum Priester geweiht. In den 1590er Jahren brachte er es zum Mestre de capela (d.h. zum Leiter des polyphonen Chors). Außerdem verbrachte Dom Pedro mindestens zweimal einige Zeit in Lissabon, als Mestre de capela des Klosters São Vicente. Ein Nachruf, der bei seinem Tod 1618 erschien, erwähnt seine Fertigkeiten nicht nur als Instrumentalist, sondern auch als Komponist und merkt an, daß er wegen seiner musikalischen Begabung an zahlreichen Häusern des Augustinerordens gefragt war. Die sakralen Werke von Pedro de Cristo—über 200 an der Zahl—bilden die Mehrheit der Handschriften von Santa Cruz aus der Zeit zwischen den 80er Jahren des 16. und den 20er Jahren des 17. Jahrhunderts; einige dieser Manuskripte wurden sogar vom Komponisten selbst verfaßt. Viele Texte, die er vertonte, entsprechen in Santa Cruz gesetzten religiösen Schwerpunkten. Ein anschauliches Beispiel ist die Motette Sanctissimi quinque martires, mit der die „fünf Märtyrer von Marokko“ gefeiert werden—Franziskaner, die 1220 starben, während sie den Moslems im Westen das Evangelium predigten, und deren Reliquien in Santa Cruz aufbewahrt wurden. Dieses Stück legt größtenteils eine konventionelle Technik des Kontrapunkts an den Tag, doch Dom Pedro bediente sich häufig eines vertikaler ausgerichteten und rhythmisch schwungvolleren Stils, der besonders deutlich abzulesen ist an seinen Vertonungen der Responsorien zur Frühmette am Weihnachtstag und an Werken für zwei Chöre (wie das hier vorliegende Magnificat im achten Modus und Ave Maria). Im Falle der Weihnachtsresponsorien ist jede Sinneinheit des Textes getrennt vertont, unter sorgsamer Beachtung der richtigen Betonung, die eine klare Form musikalischer Rhetorik schafft. Einer der besten unter den übrigen portugiesischen Komponisten, deren Werke in den Handschriften von Santa Cruz erhalten sind, ist Aires Fernandez. Leider sind uns noch keine gesicherten Fakten aus seinem Leben bekannt (wahrscheinlich war er in Coimbra tätig, möglicherweise an der dortigen Kathedrale), und von den ihm zugeschriebenen Kompositionen sind nur wenige vollständig erhalten. Die Vertonung der Marien-Antiphon Alma redemptoris mater demonstriert seine Fähigkeit, in einem sehr einfachen Gefüge wunderbar gestaltete Phrasen hervorzubringen. Was er in dieser Hinsicht geleistet hat, ist umso eindrucksvoller, weil sich der Tenorpart eng an die Choralmelodie für die Antiphon hält. Frei Manuel Cardoso wurde 1566 (nicht 1570, wie ehedem angenommen) in Fronteira in der Erzdiözese Évora geboren und am 5. Juli 1589 in seinen Orden aufgenommen. Cardoso erfreute sich zu Lebzeiten großer Wertschätzung, nicht nur wegen seines frommen Lebens, sondern auch wegen seiner außergewöhnlichen musikalischen Gaben. Er wird von berühmten Zeitgenossen aus Literatur und Musik des öfteren erwähnt, und als er 1650 starb, erinnerte man sich seiner ausnahmslos mit Zuneigung und Respekt. Cardosos Œuvre ist in fünf veröffentlichten Sammlungen überliefert: drei Bände mit Messevertonungen und zwei mit Magnificats und Motetten. Zwei der hier eingespielten Motetten—Sitivit anima mea und Non mortui—stammen dagegen aus einem der Messe-Bände, und zwar aus dem von 1625, der außerdem die Missa pro Defunctis enthält. Beide Texte haben mit dem Bestattungsritus zu tun. Die übrigen Werke wurden dem Band von 1648 entnommen, Cardosos letzter Publikation. Typisch für all diese Stücke ist die Kombination kontrapunktischer Komposition im Stile Palestrinas mit einem sehr persönlichen Harmoniebegriff. Die im Überfluß vorhandenen augmentierten Intervalle, die unvermittelten Einsätze und Progressionen und die falschen Bezüge kommen zwar nicht nur bei Cardoso vor, treten jedoch in seinen Werken deutlicher hervor als in denen portugiesischer Zeitgenossen wie Duarte Lôbo. Cardoso schrieb außerdem polychorale Werke—ein naheliegenderes Anwendungsfeld für die erwähnten Merkmale des „barocken“ Stils—doch die gingen 1755 im großen Erdbeben von Lissabon verloren. Es ist die Ergänzung seiner hervorragenden Kenntnis des klassischen Kontrapunkts nach Palestrina durch diese Merkmale, die Cardosos Musik ihre Individualität verleiht. Nos autem gloriari veranschaulicht das typische Verfahren bei der Schaffung derartiger Motetten: Sie beginnen mit gewissenhaft ausgeführter Imitation (oft von drei Stufen aus, deren zweite eine Inversion der ersten darstellt) und setzen sich in weniger strenger Manier fort, wenn auch immer mit höchstem Respekt für den vertonten Text. In Mulier quae erat ist die chromatische Nuancierung des Imitationsgefüges der Eröffnung so geartet, daß keine bestimmte Tonalität erkennbar wird, bis alle Einsätze erfolgt sind und gewissermaßen ihre Tonalität untereinander abgestimmt haben. Es mag verwundern, daß diese chromatischen Besonderheiten nicht der heiteren Ruhe zuwiderlaufen, die meist von Cardosos Musik ausgeht (seien es Motetten oder Messen); und das, scheint es, ist wahrhaftig ein Charakteristikum des Barock. Von der Missa pro Defunctis abgesehen, ist das prächtigste Beispiel für diese „chromatische Gelassenheit“ wohl in den Lamentationen zu finden. Die zu Gründonnerstag weisen in hohem Maße all jene Merkmale auf, die in den Motetten vorkommen, und doch macht sich Cardoso nie der ungebührlichen Übertreibung schuldig. Die liturgische Schicklichkeit wird immer beachtet. João Lourenço Rebelo wurde 1610 in Caminha in der Provinz Minho im Norden Portugals geboren, 44 Jahre nach Cardoso, überlebte ihn jedoch nur um 11 Jahre. Sein Bruder Marcos Soares Pereira (warum Rebelo sich genötigt sah, einen anderen Namen anzunehmen, ist unbekannt) war Kaplan und Kantor der herzöglichen Kapelle von Vila Viçosa, und als er sein Amt antrat, nahm er Rebelo mit, um ihm dort Musikunterricht erteilen zu lassen. Herzögliche (und später königliche) Gönnerschaft war ein Grundelement von Rebelos Leben, und man nimmt an, daß Johann IV. zur Vervollständigung einer Publikation von Rebelo zwei sechsstimmige Motetten geschrieben hat (von denen heute nur ein Part erhalten ist). Die Mehrzahl der Werke Rebelos wurde 1657 veröffentlicht, ein Jahr nach dem Tod des königlichen Förderers, der in seinem Testament den Druck der Ausgabe verfügt hatte. Sie enthält 14 Psalmenvertonungen (in zwei Gruppen zu je sieben; jeder Text ist zweimal vertont), vier Magnificats, Kompletoriumsmusik, zwei Lamentationen und ein Miserere. Der modern anmutende polychorale Stil der meisten dieser Werke macht Rebelo zu einer Gestalt von beträchtlicher Bedeutung für die Geschichte der portugiesischen Musik. Daneben liegen von ihm einige unveröffentlichte Werke für kleinere Ensembles vor, darunter auch Panis angelicus. Zwar kann Panis angelicus nicht mit dem Begriff polychoral umschrieben werden, doch ist dieses Werk in anderer Hinsicht ein gutes Beispiel für Rebelos Musik, denn es setzt einen charakteristischen, gelegentlich fragmentierten melodischen Stil ein, und streckenweise homophone oder nahezu homophone Stimmführung. Hier, so scheint es, werden wir der äußersten Grenze ansichtig, zu der die Kombination echter, durchgängier Kontrapunktik mit Elementen der neueren Stilrichtungen vorstoßen konnte. Insofern mag Panis angelicus als Sinnbild Portugals gelten, das zum damaligen Zeitpunkt an der äußersten Peripherie Europas stand und von den Veränderungen im übrigen Europa erst allmählich erreicht wurde.